Increase in consumption of seafood and rising per capita income are the factors driving the growth of the aquafeed market. Seafood is a good source of vitamins and minerals which helps in maintaining nutrient diet. As seafood is free from harmful carbohydrates, it protects humans from heart diseases. With the flourishing seafood business and additional demand from domesticating acquating animals, we have a profitable aquafeed market. As per our recent business intelligence report, the global aquafeed market size was $44.2 billion to $44.6 billion as of 2018, and the market demand is projected to increment at a healthy CAGR of 4% to 6% over the forecast period of 2019 to 2025. The aquafeed industry is continuously challenged to find natural ingredients that offer functional benefits yet allow optimal nutrient composition at a competitive price. Therefore, innovative companies in the aquafeed market are formulating products that have technological properties allowing the control of pellets density as well as expansion, decreasing fine proportion, and improving the stability of feed pellets. From the nutritional point of view, gelatinizing by the extrusion process makes the feed fully digestible source of energy for fish. Aquafeed is the food specially prepared for the aquatic animals. It is generally prepared by using various raw materials and additives such as fish oils and plant sources. According to IndustryARC market analysis, APAC held the largest demand share of more than 30% to 32% of the overall demand as of 2018. The World Bank estimates that in APAC region, China has the largest number of 968,627.57 million fish product consumers and then followed by India and Indonesia with 402,334.78 and 133,465.20 million respectively. Now, this wide range consumption of fish products becomes a major driving factor to the aquafeed market. Crap-type is the largely consumed product in this region, and the demand for this segment is projected to increment at a phenomenal CAGR of 29% to 31% over the forecast period of 2019-2025.The aquafeed is supplied to animals in different forms such as dry, moist and wet. In the dry form, it is available as powder, pellets, and crumbles. Based on the aquatic animal population, the supply of food in various forms is done. The emergence of new species in aquaculture and the growth of fish farming are creating new revenue avenues for the players operating in the market. The new fish species which includes meagre, amberjack, and wreckfish are more dependent on commercially manufactured compound feeds. Introduction of new algae aquaculture feed ingredient as the replacement of fishmeal and fish oil with plant-based materials, which are low in docosahexaenoic acid (DHA) in formulated feeds. More than 70 percent of fish meal protein is replaced with soybean meal without adding squid meal, krill meal, and attractants. Soybean meal increases the proteins in human body by decreasing the oils that cause health issues. Data collection and dissemination is a key element for monitoring the status and trend of ornamental fish culture. If volume and diversity of trade are better known, it will be possible to tackle other relevant issues that can lead to environmental and economic benefits for production in the aquafeed marketplace. Demand for salmonid feeds will be almost static, and it increases in aquaculture production being compensated by improvements in food conversion ratio (FCR). Equally, the market for commercial feeds is expected to increase for catfishes and other carnivorous fishes. 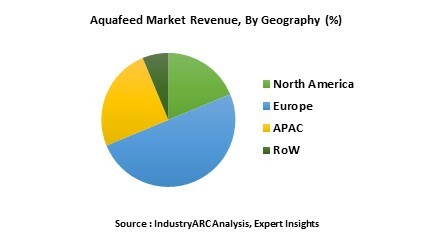 Some of the major players operating in the aquafeed market are Avanti Feeds Limited, Cargill Inc, Alltech, Archer Daniels Midland Company, Ridley Corporation Limited, Nutreco N.V, Biostadt India Limited, Nutriad, Aller Aqua A/S, and Purina Animal Nutrition.